My favorite way to remember a trip is to paint it. My favorite way to get over painter’s block is to do small paintings. Luckily this past year I took a lot of really great, beautiful trips so I had plenty of inspiration for when I wanted to do something small. Unfortunately, now my problem is that I want to move to the PNW (and I’m also running out of wall space). But these are good problems to have. I love Crested Butte. Not only do I always have the best times there (birthday weekend snowboard trips with amazing people) but the scenery is top notch. It’s hard not to be inspired to paint these mountains. The beauty and the memories make Crested Butte one of my favorite subjects to paint. My friend and I decided to do an “art a day” month beginning in October in order to be more diligent about practicing/making art. Turns out that the month of October is also “Inktober”. We didn’t follow the Inktober prompts but it was really neat to see what other artists did on a daily basis and being a part of that mini community was also a great motivator. Since I’m just starting out with watercolors, I had a lot of new styles and techniques to practice. Below are a few pieces I did in October showing the different subjects, styles, and techniques I tried out. Trying to paint the most iconic view in Boulder requires practice and a lot of it. With that said, I’m pretty happy with how things are coming along. Once I get back into the artisan fair rotation and begin to focus on my business more, I hope to offer my watercolors (mountains, flatirons, skylines, etc) as cards for sale. People are really into engagement photos and capturing the moment the proposal happens. Typically in Colorado, that’s done in a beautiful place. 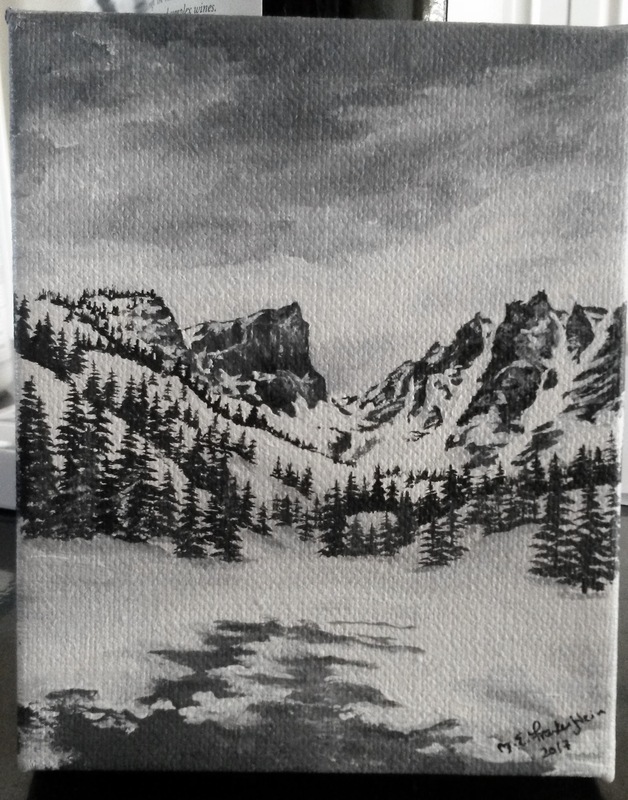 By random chance, a friend’s friends got engaged at Dream Lake the same day I completed a 4×5 painting of that location. My friend immediately contacted me about buying it as a gift for them. This sparked a little idea of doing engagement paintings (at least as gifts for friends). A few days later that same friend contacted me about commissioning a painting of her engagement as a gift for her fiance. It was then I started to think that this could be a really cool market to dip my toes into: Engagement Paintings. Colorado is full of so many picturesque spots that having an original painting of where you got engaged or tied the knot is a cool really unique way to memorialize it. The painting I ended up doing was surprisingly way harder than I had originally anticipated, but I’m (and more importantly “the client” is) pretty happy with the finished product. Acrylics have always been my strong suit. However, my style requires a lot of time and patience and recently I’ve had little of both. So in order to make me feel productive and challenge myself, I’ve picked up watercolors. Turns out, nice quality liquid watercolors are WAY more fun to use than the little crayola disk watercolors we got as elementary students. I’m excited to see the progress I’ve made in such a small amount of time and how drastically different my watercolor technique is compared to my acrylics. I also realized that making cards with watercolors is way more fun than trying to buy one from the store. Dream Lake. 2017. Acrylic on canvas 4×5. I’ve realized the best way to get out of an artist’s block is to think small. So I bought a bunch of little canvases, gathered up photos and ideas from recent trips, and then poured myself a bunch of coffee. So expect a bunch more little paintings. 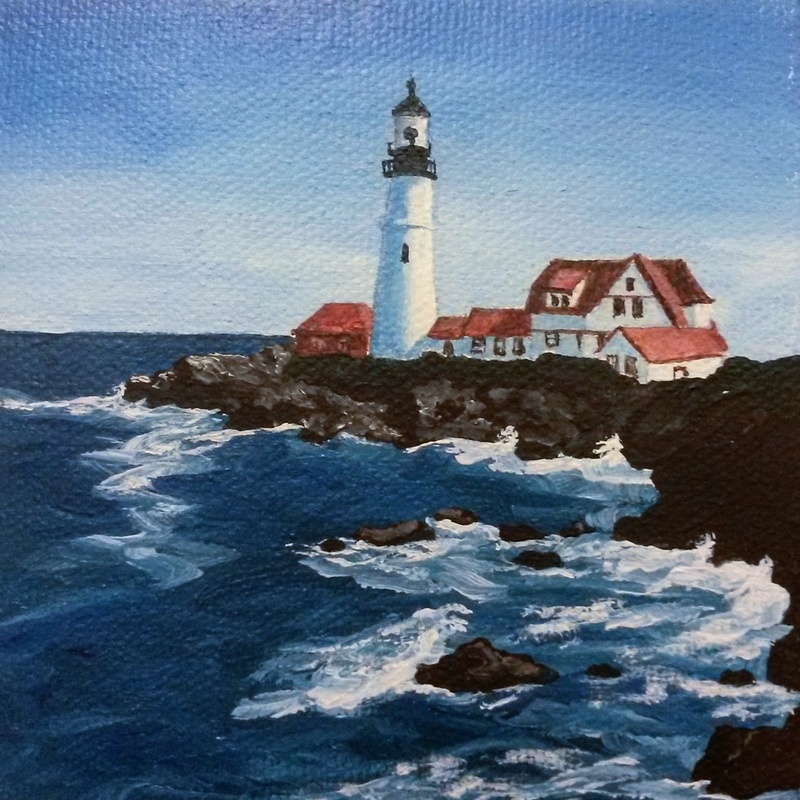 My mom special requested a small painting of Portland headlight (one of the best pictures I took while in Maine last October) so I used one of my mini 4×4 canvases and happily obliged. Once again, quick small paintings helping me out of my painting slumps.